As I approach ‘take off’ (in more ways than one) with The Style Stakes Project and my departure for New York looms ever closer, my preoccupation with all-things-Hawes duly intensifies. 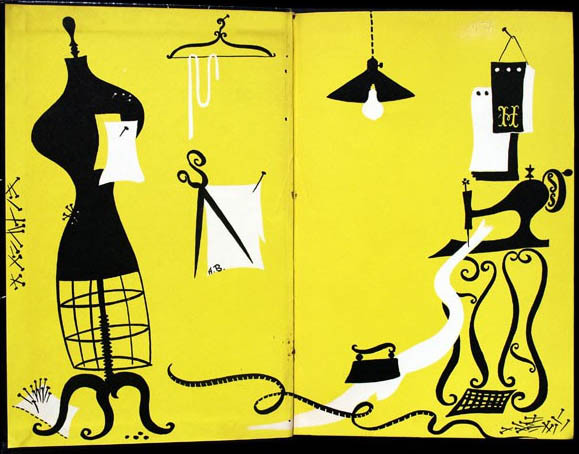 Please bear with me, then, as I offer another blogpost here on Hawes’s fascinating and oft time puzzling book Fashion is Spinach (1938). The passage I’ve selected gives a taste of her arched and acerbic remarks concerning 1930s fashion, levelling the accusation that it creates false needs (and, incidentally, this theme is reprised in her later work It’s Still Spinach, 1954). The extract cited below (Hawes: pp. 5-6) is a reasonably lucid piece of writing with a resoundingly clear sentiment. Yet elsewhere in the book the flow of consciousness is more challenging to follow and untangle (for me, at least). I wonder if this is evidence of a Surrealist influence, given it was the Thirties? Of course, it may just be a case of poor editing skills… Fashion writers take heed! “On top of style there has arisen a strange and wonderful creature called fashion. He got started at least as far back as the seventeenth century when a few smart people recognized him for what he was and is. ‘See’st thou not, I say, what a deformed thief this fashion is?’ Mr. Shakespeare demanded in Much Ado About Nothing. But nobody paid any attention… [Fashion] becomes more and more deformed with practice. Fashion is a parasite on style. Without style, he wouldn’t exist, but what he does to it is nobody’s business. Fashion is that horrid little man with an evil eye who tells you that your last winter’s coat may be in perfect physical condition, but you can’t wear it. You can’t wear it because it has a belt and this year ‘we are not showing belts.’ Fashion gets up those perfectly ghastly ideas, such as accessories should match, and proceeds to give you shoes, gloves, bag and hat all in the same hideous shade of kelly green…”. We are told ‘never to judge a book by its cover’. However, for those of us with a penchant for all things graphic (including yours truly) there’s a lot to be said for a tasteful typeface and a darling piece of design. I can’t help but make a (very favourable) judgement call on the artwork adorning designer Elizabeth Hawes’s debut book, the improbably titled Fashion is Spinach. Published in 1938 by Random House, the book is part autobiography, part political manifesto, part gossip column. And its eye-catching cover design, the handiwork of Alexey Brodovitch, is as arresting as the narrative that lies within. Over its three hundred or so pages we traverse Hawes’s first decade in her career as a fashion designer, moving from America to Paris, and back again. This in itself makes for a compelling story and her detailed account of the behind-the-scenes workings of the contemporary fashion industry is entertaining but also instructive and still has a good deal of relevance today. Hawes uses her prose as a provocation, exposing what she terms as the fashion ‘racket’. Her intention is for her American readership to see through the ‘bright cellophane wrapper’ of fashion and ultimately reject it in favour of useful, practical and stylish dressing. The cover design of Fashion is Spinach may be charming and whimsical. The tone in which it is written may be witty and impish. Yet this was, and remains, a book of substance that in 1938 exposed and questioned the very essence of the fashion system, how it operated and the balance of power within it. 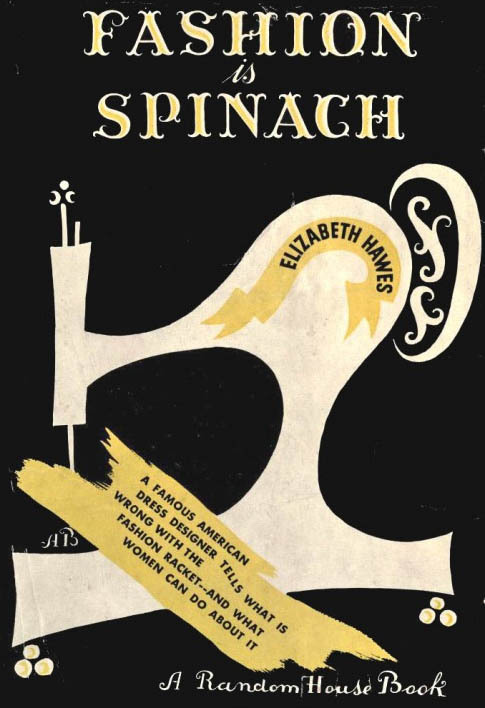 Few people in 2013, fashion scholars included, have heard of Spinach (few, for that matter, are familiar with the life and work of Elizabeth Hawes). Time, then, for this book to become a good-looking addition to the style student’s shelf. 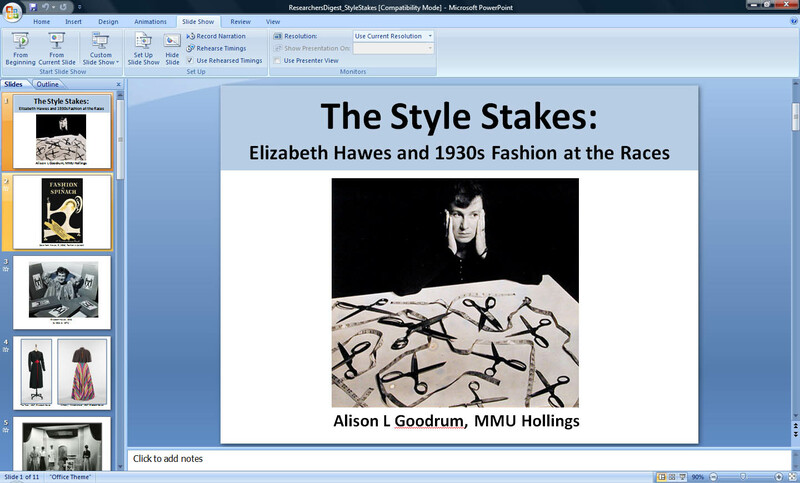 Last week I presented some of my work-in-progress on fashion and horse-racing as part of the ‘Researchers Digest’ seminar series on my ‘home turf’ (if you’ll excuse the equestrian pun) at MMU. The Series is jointly convened on a more-or-less monthly basis by MIRIAD and the Department of Apparel (Hollings) and the seminars are hosted at lunchtime in the suitably edifying surroundings of our new faculty home, the Righton Building on All Saints campus. High fashion designer, Elizabeth Hawes (1903-1971) was an outspoken figure in the development of the domestic American fashion industry. In the mid-1920s, she began her career in Paris during which time she also filed journalistic reports for the US press on the contemporary Parisian social and sartorial ‘scene’ under the pseudonym, Parasite. Hawes’ career as a writer and designer is well documented, yet a small number of fashion columns authored by Parasite for Polo, an American, male-oriented, sporting journal, have gone unnoticed in the historical record. This paper presents these columns dating from 1932 and explores the broader connection they force between equestrian events (mainly horse racing), spectator dress and seasonal couture fashion. Highly controvertible, acerbic and often bizarre in tenor, the content of Parasite’s reports give a colourful contemporary view of the winners and losers in the ‘style stakes’ on race day. Yet, importantly, this paper contends that the Parasite articles contribute far more to sporting dress history than the documenting of what was, or should be, worn by female race-goers. As a conduit between the rival fashion industries of Paris and New York, Parasite’s observations and edicts supply primary source material that mobilises a bigger contemporary picture – one of trans-Atlantic economic rivalry, of US national austerity and Depression, of a Made-in-America patriotic project, and a design revolution that crystallised the ‘American Look’.